Colors Color green changing to straw-yellow, amber, orangered, red, reddish black, to glossy purplish-black as they ripen. Shapes 3 cm long and from 2 to 3 cm in width, an aggregate of numerous succulent drupelets, each containing a single seed. 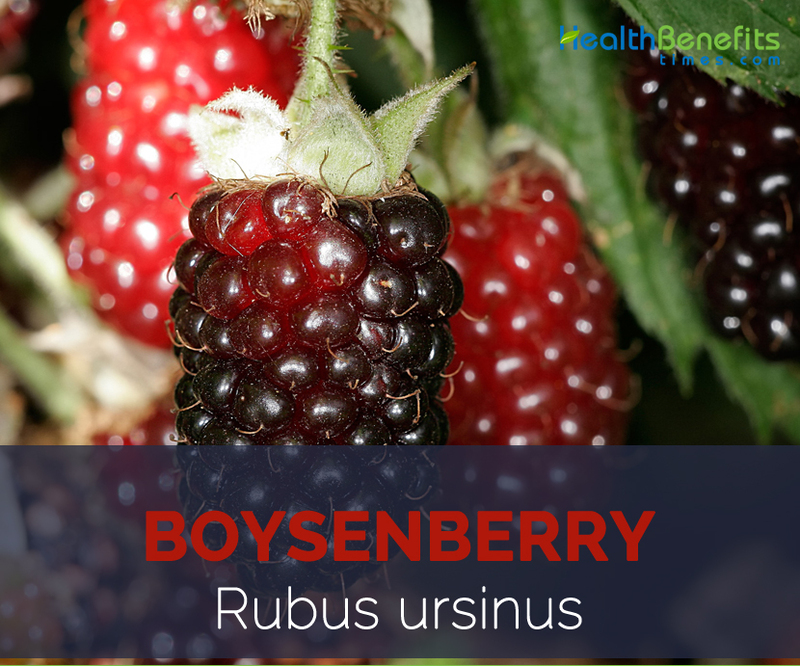 Boysenberry, scientific name, Rubus ursinus var loganobaccus cv Boysenberry, is actually a hybrid aggregate fruit that was cultivated by cross pollinating the flowers of three other berries: raspberry, loganberry and the blackberry. 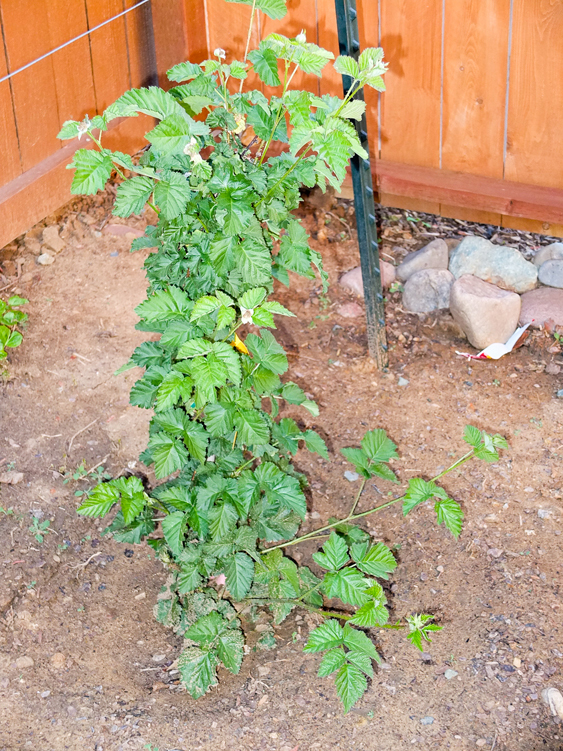 Ironically, the loganberry itself is also a cross between the raspberry and the blackberry. The fruit is named after its originator, Charles Rudolf Boysen, a Swedish berry breeder who lived in California in the 1920s. Large, dark purple, juicy and intense, it derives its distinctive flavor from its complex ancestry: sweetness and floral aroma from its raspberry grandmother, and a winy, feral tang from three native blackberry species. Due to its somewhat tangy taste it can be enjoyed fresh by the handful or made into jams, jellies, syrups, sauces, and pie fillings. They can also add a touch of sweet tartness to dessert offerings, yogurt, and smoothies. 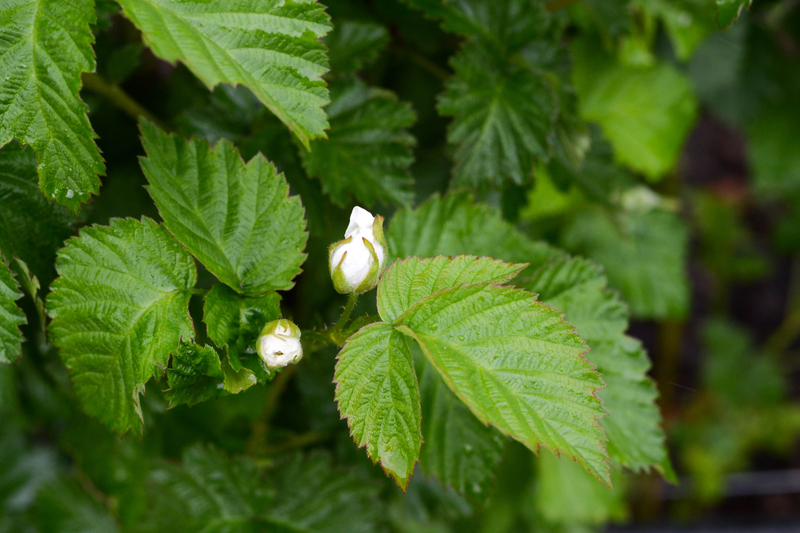 Boysenberry is a long trailing or climbing shrub, 6–7 m long. It is normally found growing in full sun to partial shade. It is usually grown on a support or trellis and needs to be protected from cold weather and strong winds. It thrives well in well drained, moist, loamy soil rich in organic matter. Leaves are normally imparinately compound with 3 shortly-stalked broadly ovate leaves with obtuse to acute to acuminate apices, serrated margins, adaxial surface darker green, abaxial surface pale green, pubescent or glabrous, with or without short prickles on the mid-vein and petioles. Similarly flowers are 2–3 cm across; produce in short racemes or cymes on flori-canes with 5 reflexed sepals, 5 mostly white spreading petals, numerous short stamens and few to many carpels on an elongated receptacle. 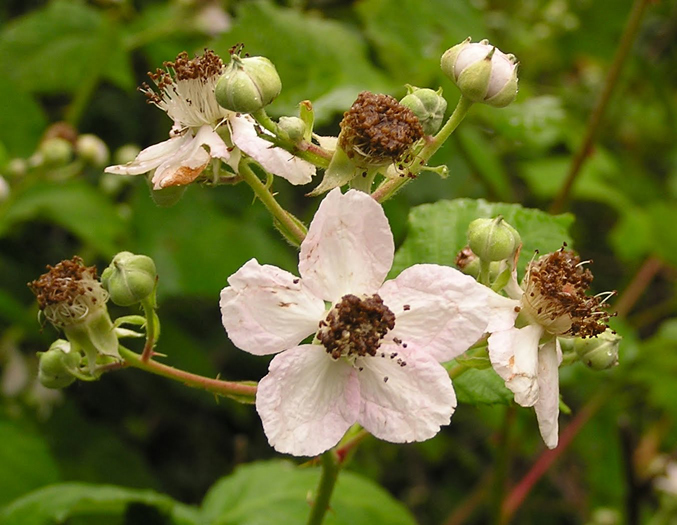 The Boysenberry is a large bramble berry with many features that are direct reflections of its parentage. Its size, shape and color are similar to the blackberry, bold in size, oval shaped with onyx and ruby hues. Boysenberry is normally 3 cm long and from 2 to 3 cm in width, an aggregate of several succulent drupelets, each containing a single seed. Fruit is usually green when young changing to straw-yellow, amber, orangered, red, reddish black, to glossy purplish-black as they ripen. The fruit has soft, glossy, thin skin. They have rich, complex, and sweet flavor with just a hint of acid and are sweet and little tangy in taste. Normally fruit weights 8.0-gram (0.28 oz.). These berries are slightly tangy in taste and can be enjoyed fresh or made into pie fillings, jams, sauces, jellies and syrups. They will add a touch of sweet tartness to smoothies, dessert offerings and yogurt. Boysenberry is named after by the originator, Rudolf Boysen, a Swedish immigrant and horticulturist who developed the crop during the Great Depression in the Napa Valley region of California. Boysenberry enjoyed commercial success under the growing guidance and development of farmer and berry “expert” Walter Knott of Knott’s Berry Farm. The Boysenberry’s popularity is the single most reason for making Knott’s Berry Farm so famous. 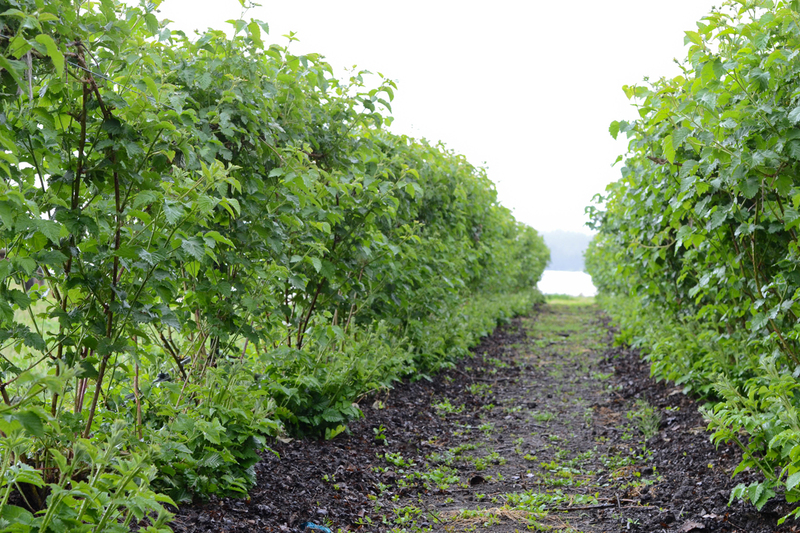 Today, Boysenberry is grown as trailing vines throughout the Western Coast of the United States and they have been naturalized in Northern New Zealand, where the fruit is grown for commercial export. Over 60% of the world’s Boysenberry production comes from New Zealand. Boysenberry is also grown in Australia. Apart from sweet and little tangy taste, boysenberry is a good source of nutrients, vitamins and minerals. Consuming 132 gram of boysenberry offers 0.722 mg of Manganese, 83 µg of Vitamin B9, 7 g of Total dietary Fiber, 1.12 mg of Iron,16.09 g of Carbohydrate, 0.106 mg of Copper,10.3 µg of Vitamin K, 1.15 mg of Vitamin E and 0.33 mg of Vitamin B5. Boysenberries have phenomenal potassium to sodium ratio, which can contribute to reduce the risk of hypertension. One cup of boysenberries contains 183 milligrams of potassium, compared to 1.3 milligrams of sodium. This helps the blood vessels relax and maintains proper blood pressure. Apart from that high potassium diet reduces strain on the heart and increases overall cardiovascular health. Boysenberries contain considerable amount of dietary fiber, which helps to prevent constipation, making one’s bowel movement easier to manage. 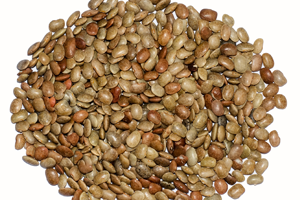 Additionally fiber can scrape cholesterol out of the arteries and blood vessels. The daily suggested dietary fiber intake for men and women are 38 grams and 25 grams, respectively. Vitamin K is generally found considerably in boysenberries. This particular vitamin helps to decreases the effect of thickened arteries. Additionally it also reduces the cause of certain diseases and kidney stones. It is a very important vitamin for maintaining the health, and further also helps in preventing diabetes. Boysenberries are full of Vitamin K which is very much essential for you. Since they can help in removing kidney stones, you should make use of this fruit. Also it contains within itself the capacity to heal and improve diabetes. Thus if you are suffering with any of these major problems, feel free to use boysenberries. They are going to improve your overall health and make sure that you are not prone to any kind of disorder. Better vision is one of the critical problems most people are facing these days. So many people have started to wear specs since they were very young. Doctors have often said that those who don’t eat boysenberry may have poor vision. These fruits consist of healthy and natural properties that will help to boost eye health and make sure your vision significantly improves from before. Boysenberries take good care of your skin. This is one of the most important benefits you will be able to derive from it. Since they are a natural blessing, you can easily consider them for your skin. You will be shocked knowing what it can do for you. You don’t need to worry about spending a lot of money at the parlor or the cosmetic store. Just make use of boysenberries and you will surely be at the receiving end. It will rejuvenate your skin and make you feel fresh, alive and beautiful. So in order to enhance your beauty, we would suggest you to use boysenberries. Heart is an important segment of your body and should receive a lot of care. In order to prevent any cardiovascular disease or heart related problems, you can certainly rely on boysenberries for this. Regular consumption of boysenberry helps to boost immunity and fight all viruses. Your cholesterol may also be reduced and you will be able to live a life that is healthy, light and very active. Weight loss is one of the biggest concerns these days. Most people do not know what kind of foods they should eat and what should they stay away from. For them, we have bought the ultimate organic fruit that will boost metabolism and help them lose a lot of weight. That is boysenberries. They are low in calories and in fat. They have often been used in salads and even as low calorie dressings. Since it is so healthy and tasty, do not hesitant to make full use of this amazing fruit. As we have mentioned before boysenberries are a good source of vitamin K, which functions in retaining calcium in the bone, reducing the risk for osteoporosis. Adequate vitamin K consumption may also reduce urinary excretion of calcium. One cup of boysenberries consists of 13 percent of the daily recommended value of vitamin K.
Regular consumption of boysenberries is highly beneficial for human brain. They actually host powerful and natural antioxidant, anthocyanin which is extremely important for a healthy brain. It offers protection against oxidative damage therefore avoiding brain aging and Alzheimer’s disorder. 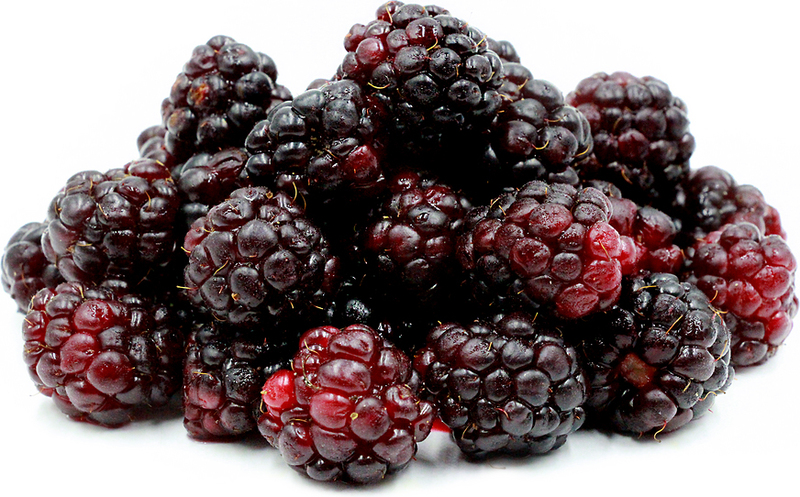 Moreover, boysenberries also play a significant role in booting memory. Boysenberries are a good source of vitamin B-complex, like folate or folic acid. Folate has shown to help in neural tube formation and red blood cell formation in prenatal babies. A deficiency of folic acid in pregnant women can lead to the birth of underweight infants and may also result in neural tube defects in newborns. 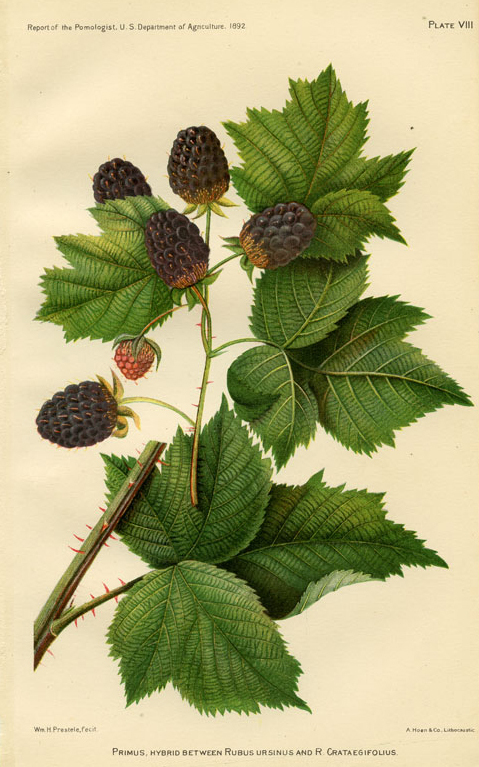 Boysenberry may be eaten fresh, in fruit salads, with ice-cream, in drinks, milk shakes or use alone with creams, in trifles, and to top fruit tarts. It can be frozen and similarly used. It can be used in jams, preserves, pies, cheesecake, muffins, cobblers, bars, pancakes and syrups, or even made into wine. Boysenberry is also used to infuse light spirits and muddle into cocktails. Calories 66 Kcal. Calories from Fat 3.06 Kcal. Calories 225 Kcal. Calories from Fat 2.79 Kcal.